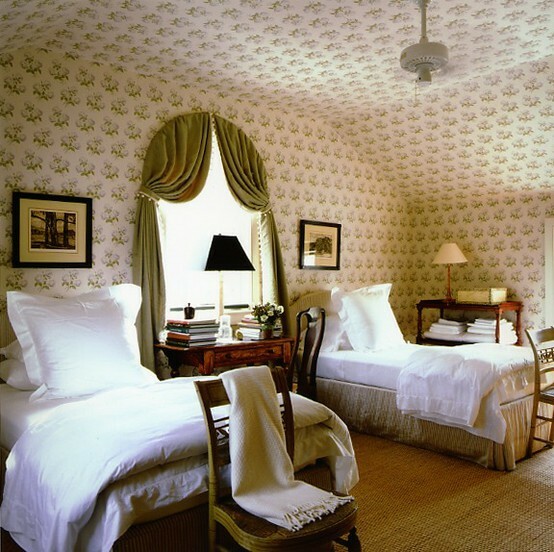 Do you know my obsession with twin bedrooms? Two beds in a room just makes my heart quicken. And these beds are stunning in their plainness. So crisp and clean. And that antique (I assume) desk nestled under the window (trimmed in olive velvet with pom-pom trim!) that serves double duty as writing station and nightstand. And all the pretty chairs. And the wallpaper that does not overwhelm but adds the needed zhush. But before the room goes too traditional on us, we slide in a natural fiber floorcovering to bring in the cool and casual factor. The only thing (and I really mean only) I'm not digging are the prints above the beds. I think we can do something with those. This is an example of neutral that is right up my alley...how about you? Would you change anything? I would love to stay in this guest room at someone else's house, but even if I started out planning for a room this neutral, it would never happen. I would surely find something pink or green or turquoise or blue and the end result would be COLOR! I just can't steer clear of it. I love that the wallpaper extends up onto the ceiling too -no boring white! I love twin bedrooms, too! This one looks calm, cool and sophisticated without being over done. Thanks for sharing. What a beautiful twin bedroom, and there is nothing I love quite like crisp, white linens. I too love twin beds in a room (only thing better is 4 or more). Also agree about the prints above the beds. The olive window treatments bring to mind Gone With the Wind!